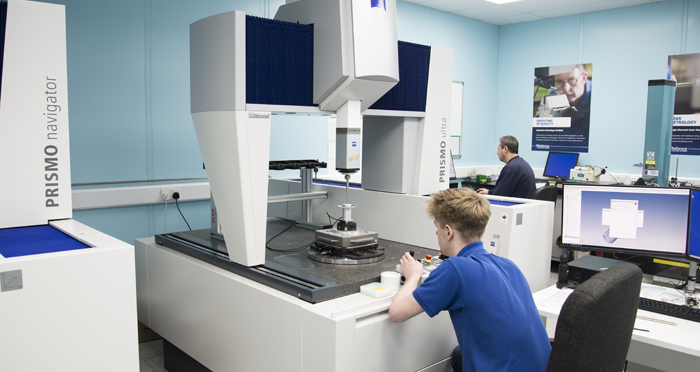 Reliance have invested in state-of-the-art measuring technology to further strengthen the capabilities of their Metrology department. A Zeiss PRISMO Navigator system has been part of the production testing and inspection process for the past 5 years, measuring the geometric form of machined parts to a high degree of accuracy and precision. Typically operating at accuracies less than 0.7 microns (ISO 10360), the PRISMO Navigator is recognised around the world for high-speed scanning and accuracy. As part of an ongoing technology investment programme, Reliance were already planning to strengthen their metrology capabilities, however, an order for development work on a new product triggered that investment to be brought forward, and a new Zeiss PRISMO Ultra system was purchased. The PRISMO Ultra further increases the accuracy capability, measuring at 0.5 microns (ISO 10360). This additional level of precision is achieved through more accurate scales, an improved air bearing system and active air damping which negates any surrounding vibrations. Operating in tightly controlled environmental conditions within the Metrology department, the system is ideal for development projects where more complex elements need to be precisely and highly accurately measured and recorded.